THE SKINNY: Peter Thomas Roth makes a perfectly fine CC cream. This moisturizer/corrector does everything it promises. It moisturizes. It covers up fine lines and blemishes. It evens out skin tone. It feels creamy on my skin. But I wasn't blown away. And for $48, I really do expect to be blown away. According to the advertising, an Amazonian superfruit rich in Vitamin C is what sets this CC cream apart. Peter Thomas Roth uses camu camu, a fruit with 30 times the Vitamin C of an average orange. This CC cream is SPF 3 and comes in three shades. I tried both the light/medium and the medium/tan. My fair skin would need the light/medium most of the year and the medium/tan in summer. KEEP OR TOSS: Keep the sample, but a full size is a little pricy for me. 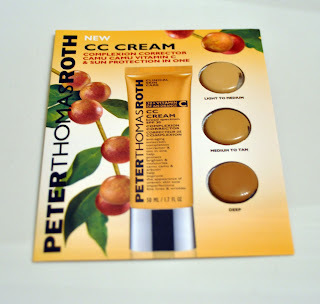 CHECK IT OUT: Find Peter Thomas Roth CC Cream at Sephora.